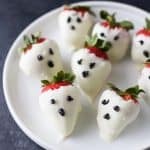 Fun Festive Chocolate Covered Strawberry Ghosts – perfect for a healthy spooky treat this Halloween season! Place white chocolate wafers in a small bowl. Put in microwave in 30 second increments until chocolate is melted and smooth. Dunk strawberries in the chocolate and place on prepared baking sheet. Continue process until all strawberries are covered. Place in the refrigerator for 5 minutes to let the chocolate harden and cool. If you’re not serving the strawberries right away keep them in the refrigerator. I wouldn’t keep them longer than 1-2 days.